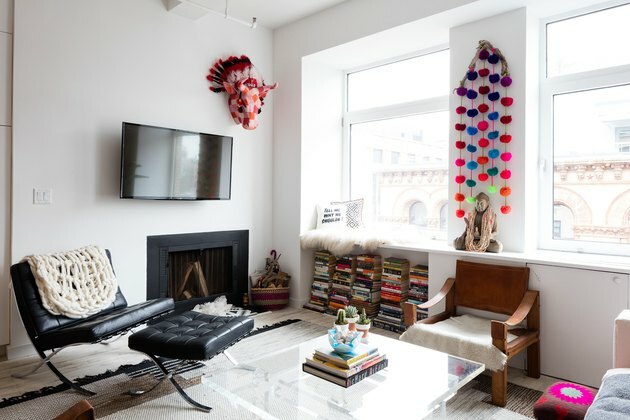 When brand consultant Marika Wagle went looking for a home in New York City, a condo in the Silk Building in NoHo was a perfect match. Originally built in 1908, the landmarked building was converted into residences in 1987 and its history as a factory for silk garments made it ideal for Wagle, a former fashion exec. But what wasn't ideal was the duplex apartment's dated condition. That's when Hatchet Design Build came on board to brighten and modernize the home. They started by removing a few walls to open up the space in the main area. The apartment's original floors were stripped to showcase the character of the wood and help lighten up the home. 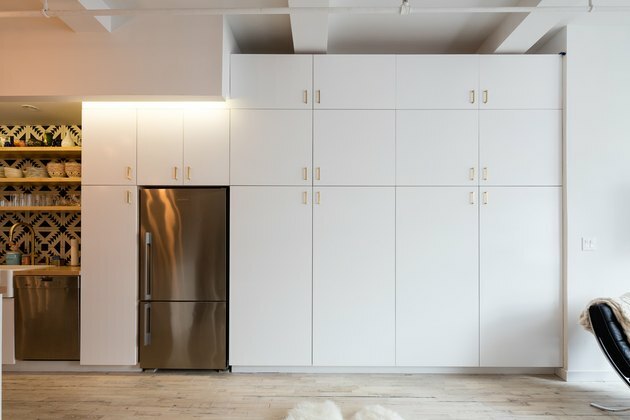 Custom millwork was added throughout the apartment — a tricky task given that historic buildings are notorious for their lack of right angles. 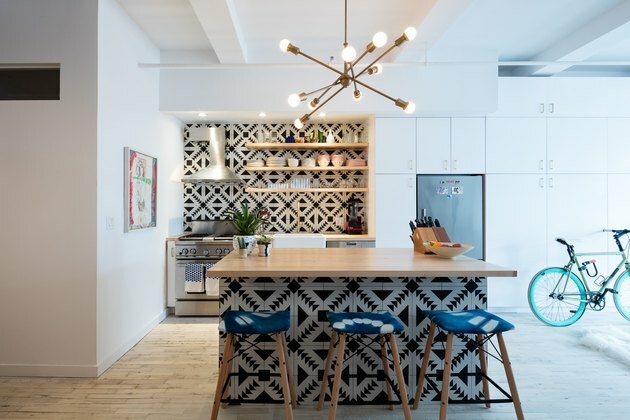 Since they kept the walls and millwork bright white, the firm installed graphic encaustic tile in the kitchen and bathrooms for contrast. Wagle added her own fashionable touches to the decor, incorporating colorful finds from her travels. 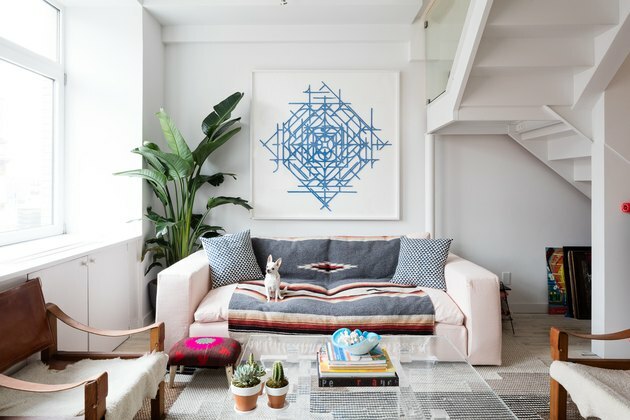 In the living area, a geometric artwork hangs above a pale-pink sofa, which according to Wagle's Instagram, has recently been tie-dyed. The Lucite coffee table keeps the space from feeling cluttered. Colorful pompoms add personality to the living area. Hatchet Design Build's sister company Good Dog Rosie created the custom storage units beneath the windows. An entire wall of cabinetry sits between the open kitchen and living area. The kitchen cabinets were removed and replaced with open shelving to highlight the tile from Cement Tile Shop. Hatchet also installed a new island, which is illuminated by a chandelier by Sazerac Stitches. 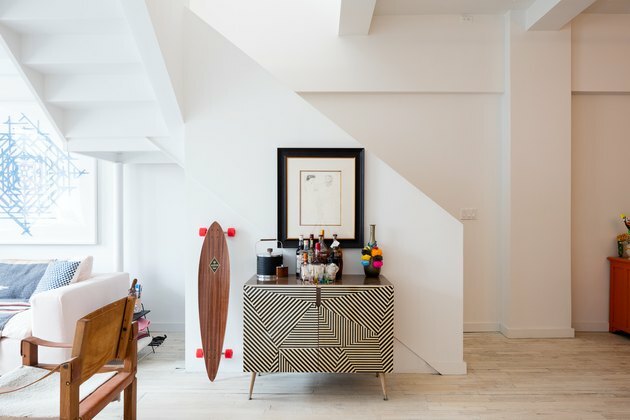 A Deny Designs credenza doubles as a bar beside the staircase to the loft bedroom. Finds from Wagle's travels are displayed in the dining area, along with art by family and friends. 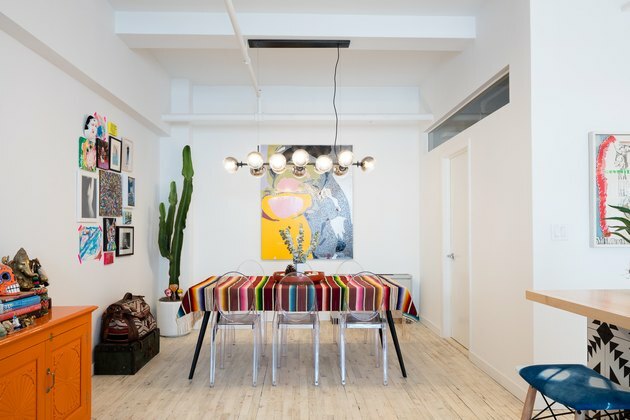 Lucite chairs surround a table topped with colorful fabric. 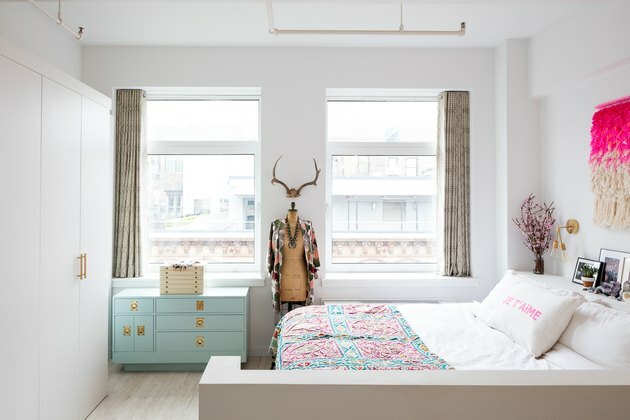 The loft area uses its square footage efficiently with a built-in bed and storage. Wall sconces by Sazerac Stitches were installed behind the bed. 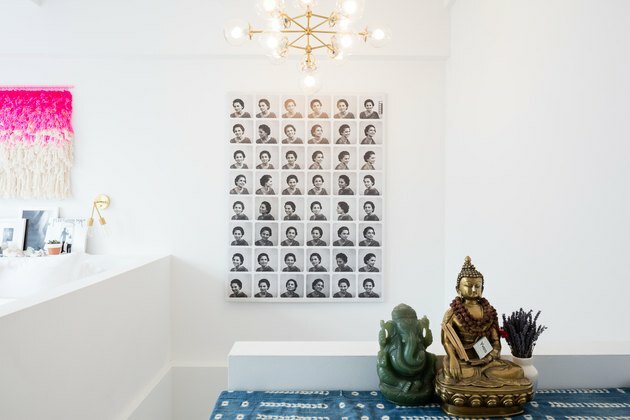 Photos of Wagle's grandmother were used to create an installation in the staircase. The Sazerac Stitches chandelier illuminates both levels of the duplex. 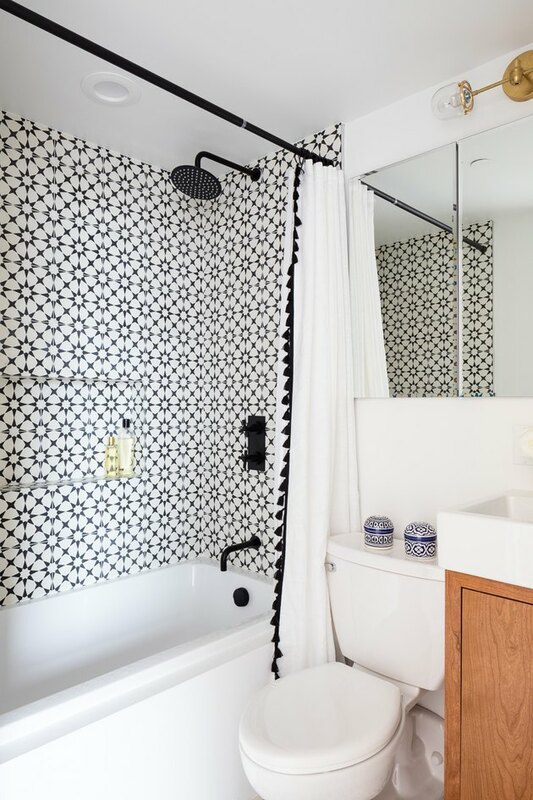 Black shower fittings complement the geometric tile from Cement Tile Shop, which was installed in both of the bathrooms.